Digital business transformation is a huge and confusing topic, making it very difficult to know where to begin. The Open ROADS Community has created the Digital Mastermind to answer this question and guide your entire transformation journey. The essence of this method, which we call “Digital Thinking” is to “Identify a Scenario, then Start Small, Think Big, and Align Business & IT to Scale Fast”. This is encapsulated in the figure below. To put this into practice, a dedicated transformation team should focus on the transformation activities on the right of the figure: Supporting the organisation to benchmark current digital maturity, defining a direction for the transformation, and then handling the change management and progress tracking. The will enable the business team, in parallel, to adopt Digital Thinking through the approach on the left, moving to become an increasingly digital business. Of course, like every journey, you need to know where you are before you can set off. In this case, the first step in your digital business transformation should be to get an understanding and benchmark of your business’s current digital maturity level. With multi-million dollar investments at stake, it is imperative that a comprehensive digital maturity assessment be conducted, using a sophisticated digital maturity model, and driven by subject matter experts. That said, recent research by the Open ROADS Community has shown that even a cursory evaluation of a business’s digital maturity can give sufficient insight to determine a general way forward for the transformation, and thereby stimulate business leadership to sign-off on a full digital maturity assessment. Typified by low levels of maturity across all areas, these organisations have not yet made significant progress on any aspect of digital transformation. In this situation the organisation should initially focus on technology investments to make itself more efficient through increased digitisation. This will drive down operating costs, while enabling subsequent digital initiatives to be adopted. Typified by relatively higher levels of maturity towards the right, technology, side of the model, these organisations have already achieved a good level of efficiency through digitisation. They should now look to exploit this to gain new revenue through the introduction of digital initiatives to increase customer experience and deliver new services. Typified by relatively higher levels of maturity in most areas apart from Innovation and Lean Delivery, these organisations have achieved a good level of efficiency through digitisation, and are now actively delivering a good level of customer experience. However, they now need to further develop their operating model, adopting lean principles with continuous delivery to seize the additional revenue available from more rapid service development and deployment. In fact, careful manipulation of the data can reveal further insights, including whether inter-departmental cooperation is strong enough to allow customer experience and efficiency to develop in parallel. You can hear more about the Digital Mastermind by attending my talk at TM Forum Digital Transformation Asia in Kuala Lumpur from 13-15th November. You can also discover more here. 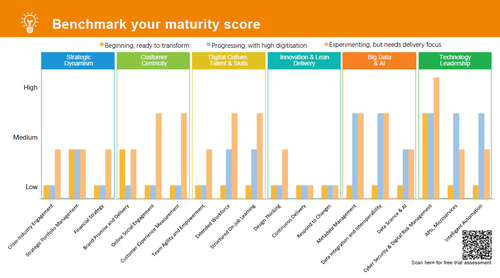 Finally, if you’d like to get an idea of your own organisation’s digital business maturity, you can try the 10-minute survey for yourself here. You will immediately get a personalised result, which can be anonymous if you wish. Aggregated results will be shared at TM Forum Digital Transformation Asia.